Initially it was a trip planned with my best friends. We spent 1 1/2 weeks in LA, 1 1/2 weeks in New York, and then I flew to St. Louis, Missouri to spend time with relatives for one week. I decided to extend my stay and head back to New York. You see, after ending a seven-year relationship two years ago, I spent the last two years healing and finding myself. But my trips were always short, seven days at the most, and usually with friends. I realized I needed a longer time away from everything, to be in a place where I didn’t know anyone. This is why I decided to extend for another month—this time alone. How did you prepare for the long trip? Although I prepared for my original trip with my friends six months before, my sudden extension felt nothing short of Divine Intervention. The last few weeks before my departure were emotionally draining. I had to face all my issues that piled up through the years. On the day of my flight, my trip symbolized letting go and moving on to the next chapter. I watched a lot of Broadway shows and hung out in the parks just to people-watch and listen to my music. I also pulled a Carrie Bradshaw and dated around. Then one day I met a great guy—something I never expected to happen. During our first date he asked me what my favorite places are in New York, and then he started organizing romantic dates in every place I mentioned—like watching the stars in Central Park, sunset in Brooklyn Park, and an outdoor movie in Bryant Park. I thought it would just be a summer fling, but he’s been calling me up every day since I returned to Manila. I’m taking this long-distance thing day by day. Sometimes, in the middle of an ordinary life, love gives you a fairytale. Let’s see where it goes. I knew being in the US meant temptation to shop, so I packed only four pairs of comfortable sneakers and three pairs of clothing, as well as my go-to skin care regimen and makeup. The rest I bought throughout my trip. What lessons did you learn during your trip? Alone time is when you distance myself from all the voices of the world so that you could hear your own. Be open to change and opportunities, and embrace every experience that comes your way. Walking around Time Square by myself, with my earphones and Spotify in full blast, I felt like Rachel Berry from Glee when she just arrived in New York! I was just walking around with a smile on my face and soaking in every moment. I was one of eight million people in a city that never sleeps, but in that moment I never felt more rested. How much did you spend in the entire trip? More or less P400,000 for both my trip with my best friends and my solo extension in New York. I paid for it myself. I always see trips as my gift and obligation to myself. Therefore, I should be responsible enough to pay for it. 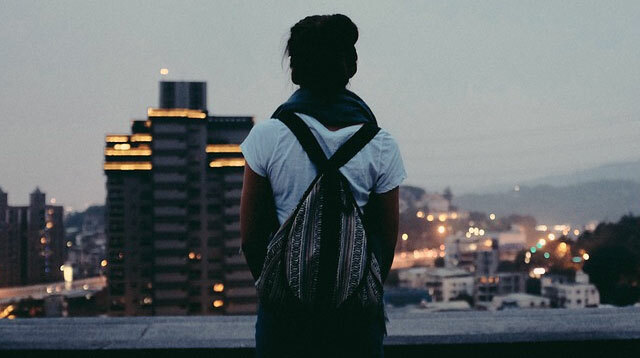 Will you ever travel solo again? Yes! We women owe it to ourselves to do this every now and then. Every time I go on a trip, I come back a better person. What are your tips for fellow CGs who want to travel alone? Pack light and get a data plan so that you can access Google Maps (This is a life saver, I swear!). Open yourself up to endless possibilities. Enjoy and savor every moment. Whenever I read travel magazines, I would always tell myself that I want to visit those places. I started saving up for travel back in 2008, but couldn’t really find the time to do so. I was 27 and had just ended a long-term relationship, so I told myself it’s time to go! I planned for an 18-day trip to LA, Las Vegas, and San Diego. I browsed through travel blogs and listed all the places I wanted to see, the food I wanted to eat, and how to navigate with the cheapest budget possible. I read many articles on traveling solo. I spent my first three days exploring the beach coast and downtown L.A. On day three, I took an Amtrak ride to San Diego, where I spent three days shopping and exploring. I drove a rented car on day seven and found myself in a hole-in-the-wall restaurant before heading to the beach for happy hour. On day eight I took the Amtrak to Las Vegas, where I stayed for three days before taking a flight to San Francisco. I spent my remaining week there before flying back to Manila. Most of my trip I was alone, but there were times I visited friends and relatives. Getting lost! I always found myself lost during my trip. Asking for directions proved to be difficult. It’s not that people weren’t willing to help, but some were just not good in giving directions. Also, public transportation tends to change schedules and looking for an alternative was quite challenging. I ended up walking blocks upon blocks just to go to the nearest bus station. It was 2008 and Uber wasn’t invented yet! What lessons did you learn from your trip? Getting lost is okay sometimes because it makes you explore the places less frequented by tourists. It makes you feel like a local and forces you to be independent. When I rented a car in San Diego, I went to the beach for happy hour and it was one of my best experiences ever! I met new people, ate unlimited tacos, and drank margaritas with them for half the price while lazing on beanbags by the shore all night. We chilled to Bob Marley songs until the sun rose the next day. Me. I saved up by bringing baon to work instead of buying food and woke up three hours earlier every Monday so that I could ride with my cousin to work to save on gas and parking. I also set aside an amount every payday. Did you ever travel solo again? 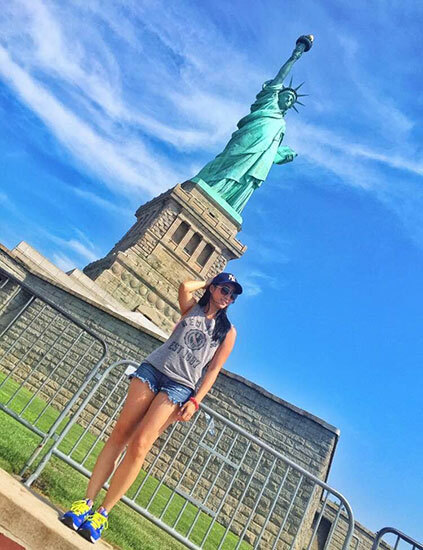 Yes, I went to New York alone for two months in 2015. No matter how prepared you are, things won’t always go as planned, so be ready for an adventure and make the most out of it. I had a multiple entry 10-year US visa that I did not have the chance to use because my mother had kidney failure and did hemodialysis for eight years. During those times, I was helping my parents make ends meet and any plans for travel was not financially possible. One day I had the opportunity to work in Dubai, but my basic salary was just enough to send back home. My US visa was about to expire, so I decided to save up for my childhood dream of visiting Disneyland and my family in the US. I was 28 years old at the time. For two years I saved all my tips from guests, worked extra hours, and became a part-time babysitter on my days off. To manage my expectations for the trip, my whole attitude was to just enjoy every moment. I also did some research on food and places I wanted to try and see, and asked my family which ones were possible to do or try during my stay. It was a trip of many firsts. 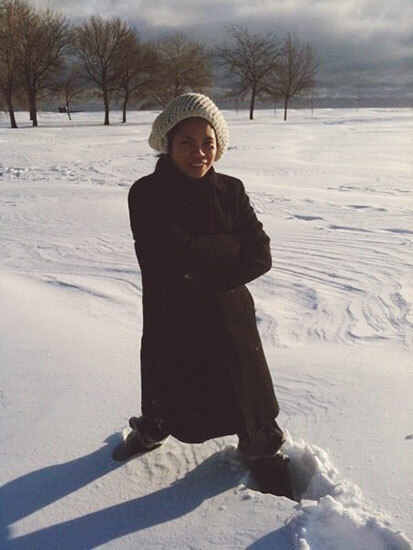 On my first day I visited my sister’s family in Chicago, where I experienced snow for the first time in my life. 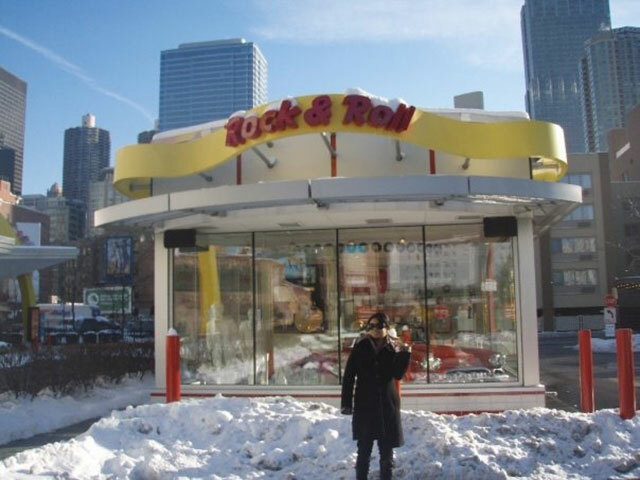 I also ate at the first-ever McDonald’s restaurant in the suburbs. After that I flew to LA to fulfill my childhood dream of going to Disneyland. I bought my own Mickey Mouse ears and wore them from opening to closing. The next day I went to California Adventure, the theme park right beside Disneyland, and went on every single ride! I explored Long Beach with relatives and friends. On my second week I went to San Francisco to visit more friends and relatives. It was my first time to see tourist spots like Fisherman’s Wharf, Pier 39, and the Golden Gate Bridge. 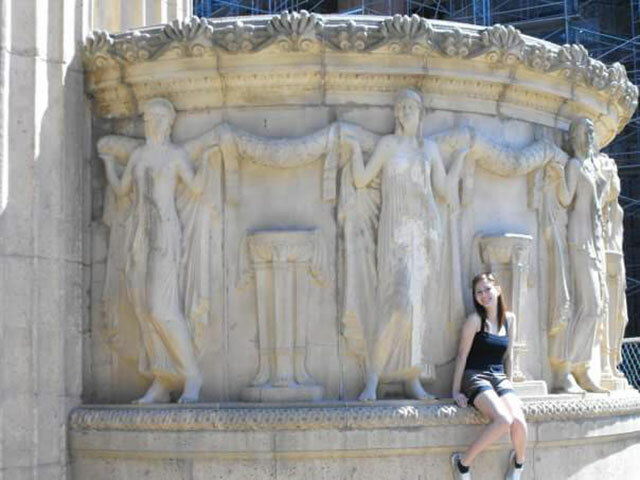 I fell in love with the Palace of Fine Arts, where it was my first time to see swans up close. I spent my third week back in LA, where it was my first time to stay overnight in a motel by myself. My room was on the ground floor. I blocked the door with a chair and table, and slept with the lights on because the door did not have a double bolted lock. To sustain myself throughout my trip I followed a budget and made sure I did not go over it. At the time I did not have any credit card and paid with cash. Whenever I was out, I only consumed my budget for the day and an extra $20 for emergency, in case I had to make a call or use public transport. The rest of my pocket money I did not bring with me so I wouldn’t get tempted to spend it. I almost lost the first leg of my trip. There was a snowstorm in Chicago and my original direct flight to Chicago was cancelled. I could not afford to travel on a later date. Thankfully my travel agent was able to re-book my ticket with a code-share airline via Frankfurt. I was able to stick to my travel dates. I learned to be a smart traveler by being alert at airports, respectful of security and airline rules, and cautious of my surroundings when sightseeing. When you get out of your comfort zone and open yourself to new experiences, the universe conspires to amaze you! Who funded your trip? Everything came mostly from my pocket, but family and friends helped pay for some of my food and transportation. Did you ever travel solo again? Absolutely! Since then I had traveled solo across the US, spent my birthday in New York for three days, flew to Houston to attend Joel Osteen’s Church service for a weekend, and spent days living like a local in Amsterdam, Vienna, Rome, Milan, Verona, Venice, and Germany. Try anything and everything at least once—as long as it’s not illegal, and will not put you or your loved ones in danger. YOLO with caution.